In its counter, the RBI Board noted that "while any incidence of counterfeiting is a concern, Rs 400 crore as a percentage of the total quantum of currency in circulation in the country is not very significant". Less than four hours before Prime Minister Narendra Modi announced demonetisation on November 8, 2016, the Central Board of the Reserve Bank of India (RBI) gave its approval to the scheme but also rejected, in writing, two of the key justifications — black money and counterfeit notes — that he would make in his televised address to the nation. The minutes of the 561st meeting of the RBI’s Central Board, which was convened hurriedly in New Delhi at 5.30 pm that day, reveal that the central bank’s directors described the move as “commendable” but also warned that demonetisation “will have a short-term negative effect on the GDP for the current year”. The minutes were signed by RBI Governor Urjit Patel on December 15, 2016, five weeks after the meeting was held. In all, six objections, described as “significant observations”, were recorded in the minutes by the RBI Board. The RBI directors, after receiving a proposal draft of the scheme from the Ministry of Finance on November 7, 2016, argued that the government’s reasoning, that the withdrawal of HD (high denomination) currency notes of Rs 1,000 and Rs 500 would help in curbing black money and restrict circulation of counterfeit cash, did not really hold good. The minutes list out the justifications given by the Ministry of Finance. On fake currency, the Ministry informed the Board that counterfeiting is on the rise in denominations of Rs 1,000 and Rs 500, and the total quantity of such currency is estimated to be around Rs 400 crore. 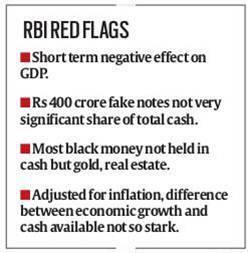 In its counter, the RBI Board noted that “while any incidence of counterfeiting is a concern, Rs 400 crore as a percentage of the total quantum of currency in circulation in the country is not very significant”. Among the other counter-points, the Board recorded that the growth of the Indian economy and its linkage to the high amount of HD currency in circulation, as pointed out in the government’s proposal, was flawed since the rate of inflation had not been taken into consideration. The Board also put in writing that it envisaged that the withdrawal of HD currency notes would have a negative impact on two sectors in particular: medical and tourism. Thus, it pointed out, private medical stores should also be included in the exemption list. The minutes include an “assurance” that the issue of demonetisation was under discussion between the central government and the RBI for six months during which “most of these issues had been discussed”.